It’s freezing cold here in the UK again as the mini Beast from the East has just visited. They are calling it mini (they = the media) but, to be honest, this Beast from the East is just as bad as the first Beast from the East that blew in a couple of weeks ago. Snow everywhere and lots of it. Look at those lovely Sheep! Taking advantage of the bitter cold I wrapped up in my latest knit, a design by Drew Emborsky called Wind on the Sand. The photos were quick shots as the wind was blowing hard making it feel much colder than it was. I actually completed this knit sometime in January but as I have been moving house, and country, I have got a bit behind in my blogging schedule. 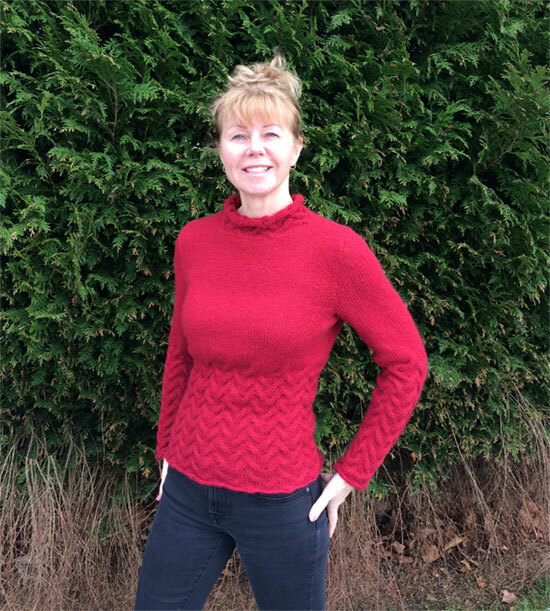 Drew’s original design was knitted in Blue Sky Alpacas Worsted Cotton but I used Rowan Kid Classic in the shade Cherry Red and added some beads to the collar….which you can’t really see in the photos. I found the pattern while I was going through piles of old knitting magazines during the preparation to my house move. I had to decide what I wanted to keep and what to throw out. 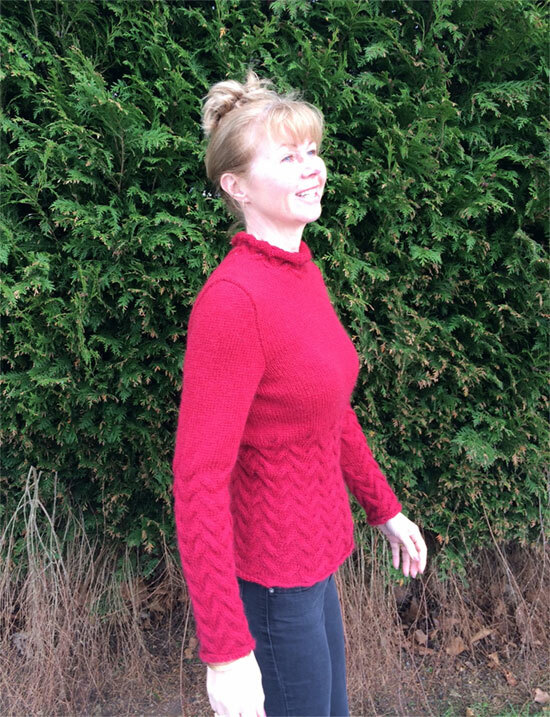 This pattern, which was in the December 2010 issue of Knit ’n Style, went into the “keep” pile and I pulled out all the Cherry Red Kid Classic from my stash before it went into storage. Practically all my house contents are still in storage, including all my knitting and crocheting stash and associated stuff, except my Felted Tweed balls to complete Lisa Richardson’s CAL 2017. There is still no sign of a moving in date; this whole process is taking far too long. 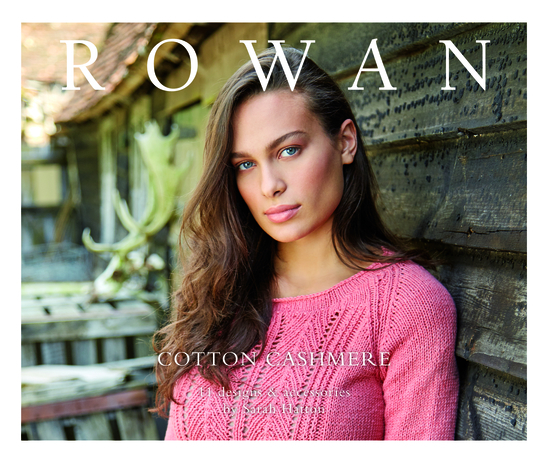 I was hoping that I would be knitting some spring and summer tops and cardigans by now, maybe using Rowan Cotton Cashmere as it felt just lovely. And looking at the Cotton Cashmere pattern book that accompanies the yarn……. I do quite like the design on the front cover called Amure….. I managed to get a couple of balls of Cotton Cashmere from Rowan before I left the US but they had to go into storage with the rest of my stash. I suppose it won’t be too late to knit up something in July which might be about when my house contents will have been shipped to my new house. Until then I will continue with crocheting my Felted Tweed blanket as I didn’t have time to finish it last year with all the house sorting and packing. And, as it is the first day of Spring, Happy Spring! This entry was posted in Crochet Along, Knitting with Rowan Yarns and tagged Drew Emborsky, Kid Classic, Lisa Richardson by Esther. Bookmark the permalink. They are all so beautiful. 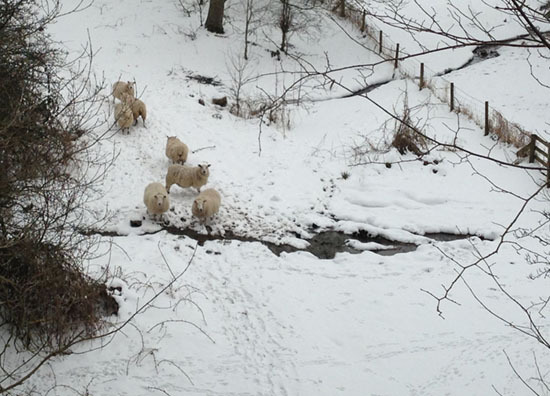 The picture of the sheep is so nice, but cold. How is everyone doing at Rowan? At this time I am going through a dilemma. I have little incentives to knit. Trying to get back on my feet after the flood. My stash was quite extensive and my library alike wise. I had several fairisle patterns that I designed as well as blankets. That was then, now its a matter of starting over. Thank you so much for you email, stay warm .